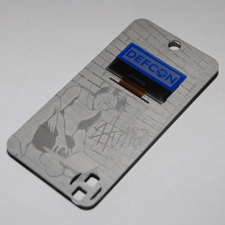 The DEFCON 18 Badge was created for the 2010 edition of DEFCON, the largest and oldest continuously running hacker and computer security convention in the world. 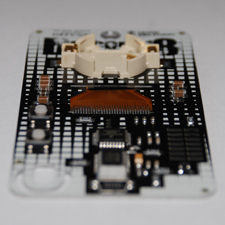 It features active electronics mounted on an artistically designed, aluminum substrate printed circuit board. The badge is based on a Freescale MC56F8006 16-bit digital signal controller and a Kent Displays 128×32 pixel reflective cholesteric liquid crystal display (ChLCD). Other functionality includes USB connectivity, seamless power switching, and hidden modes for a variety of contests held at the conference. Source code was developed using the freely available CodeWarrior for 56800/E Digital Signal Controllers. A single CR2032 3V Lithium coin cell battery provides the required power. 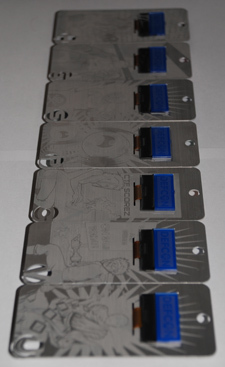 A total of 7,780 badges were manufactured with unique laser engraved graphics used to denote each type of DEFCON clientele: Human, Goon, Press, Speaker, Vendor, Contest Organizer, and Uber (awarded to the winners of official DEFCON contests). For the fifth year in a row, Joe Grand of Grand Idea Studio hosted the DEFCON Badge Hacking Contest, which awards the most ingenious, obscure, mischievous, or technologically astounding badge modification created during the weekend conference. There were 21 official entries in this year’s contest. The winning entry was a UPC-A/UPC-E Barcode Writer/Emulator by Brad Threatt designed to fool the self-checkout scanners used at major retailers. Additional contest information can be found at the Contest Results posting on the DEFCON Forums.